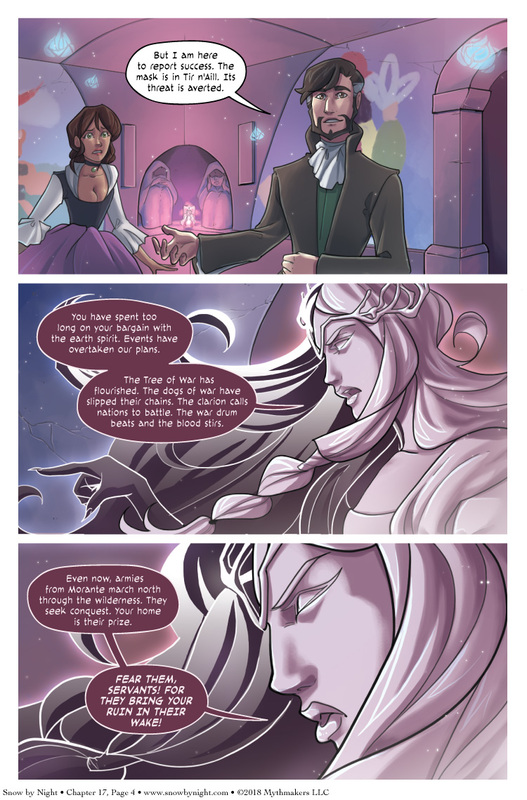 Melaithe’s Emissary has a penchant for purple prose and brings a dire warning. Vote for Snow by Night on Top Web Comics to see a preview of the last page in this scene and remember that the Emissary is just a shadow on the wall! I really like the design and look of this spirit. I also like reason for the ire is because their plans didn’t come first. In Cienan’s defense, I’ll bet that’s not easy to prioritize. Purple prose in purple text boxes? I like what you did, there. It can’t just be me who takes just a little pleasure in seeing some shadow of uncertainty on his face for ONCE. Well, his name can sort of be rendered Ultracertainguy Whogoeswiddershins. Although I am no scholar and would appreciate correction. Yes, a little surprise is unfamiliar to him, it seems. I was beginning to fear Cienan would have everything predicted and always be on top of things throughout the plot. It’s nice to see him (apparently) caught flat-footed. “… the dogs of war …” annnnnd now I’m picturing a ship loaded with State Alchemists. This spirit has an old world feel to it, unlike Snow who is very new world. In fact I would say the Emissary is almost eleven in feel, lik.ly just the crown she is wearing. If she is a old world spirit then are they like the old world human nations spreading to the new world?